Keith Tyson's Artmachine (1992) is an automated device for creating art ideas. 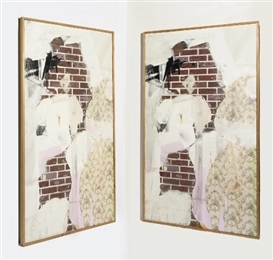 Through an algorithm or specific set of instructions the machine will, given a specific state, generate a set of instructions for an artwork. The database of potential starting points contains the world and everything in it. Tyson then has to deal with the problem of how to carry out the machine's instructions - what he describes as an 'executive' rather than a 'creative' role. 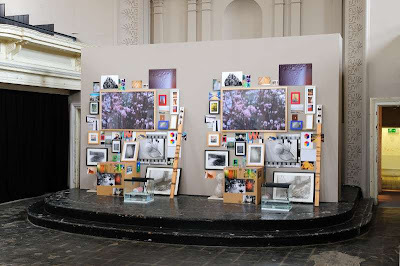 In the Repeater Series Tyson has utilised the instructions given by the Artmachine to create a series of works that present what initially seems to be two or more identical objects, paintings, photographs, sculptures or assemblages. In fact these repetitions are separated by carefully monitored, specified forms of measurement: time, space, weight etc. 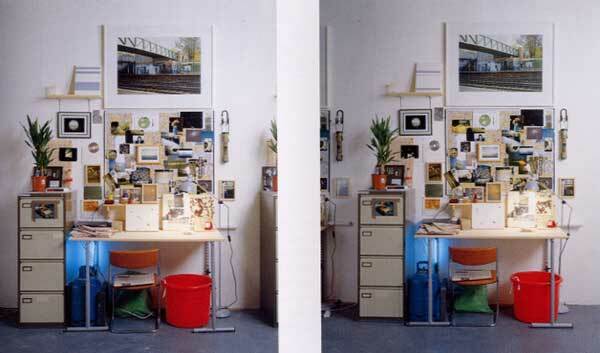 In Dual Workstations... (above) the two almost identical workstations are in fact created to exist sixty seconds apart; A clock and a readout on a digital NASA weather chart reveal the change most explicity, 2 plants, planted exactly 60 seconds apart, are less obvious at first glance. In A Universal Cooling... (below) the two assemblages are separated by a temperature change of 1 degree celsius.